Some time ago, when I was heading through Colorado on a bit of a cross country road trip, I stopped south of Denver to stay with a friend in Littleton. Prior to my arrival, I asked him if there were any things to do in Denver, as I had a few hours to kill, to which he assured me there was no reason to set foot into Denver, and Boulder would be a better use of my time. Looking back now, I am glad I got to see Boulder but in skipping Denver, I bypassed going to Novo Coffee (instead I picked another spot on my list that sadly ended up closing soon after). Thus I will visit Novo's cafe one day but for now, I'll settle for distant encounters with their coffee east of the Mississippi. 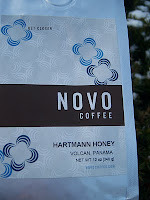 One such occasion was on a recent partially compensated GoCoffeeGo order (this is the 2nd of the 3 coffees to be reviewed), whence I received 3/4 lb of Hartmann Honey, a coffee from Volcan, Panama that looked very enticing. I received the coffee fairly quickly (3-4 days) and dove right in, subjecting it to three different styles of infusion: french press, drip and siphon. I pressed it first, finding to my astonishment that the coffee actually had a strong taste of honey (most coffees only offer hints of such flavor), more akin to a bowl of Honey Nut Cheerios (it even had whole grain sweetness! ), as well as little fig and a light body. The drip turned out much lighter, this time with less honey, more nut (like peanuts) and with a stronger, wheaty/grassy sweetness coupled with a bit of dark cocoa. The vacuum pot produced a little more nuttiness in the front of the cup, still the noticeable honey similar to the drip (i.e. still had the honey nut cheerio taste) and minor facets of wheat grass. A little heavier body was produced. While I know that this coffee is no longer offered by Novo or GoCoffeeGo (sometimes GoCoffeeGo has different coffees than the roaster offers), Novo does have a coffee from Volcan (as of today, at least) that seems similar to this. If said coffee produces such a quality brew as Hartmann Honey, I would strongly recommend a purchase. I wish they still had that, any coffee that even slightly resembles hints of honey nut cheerios is on my to try list. Heartily recommend that you stop at the exceptional Novo Coffee cafe in downtown Denver (adjacent to the centrally located Denver Art Museum, or DAM). I'd rate it among the best of the cafes that you recommend. Gotta, say: Thanks for sharing your observations so generously, expertly, discriminatingly, and with rich detail. Lovely and useful blog! Honey is one of my favorite "flavors" in all of food. I add it to almost all of my cups of coffee anyway. Did you know it is suppose to be good for allergies? Just a side benefit to the taste as far as I am concerned. Love the reviews. Gonna try this one as soon as I find a bag.